The SEAFDEC Aquaculture Department is mandated to: 1) promote and undertake aquaculture research that is relevant and appropriate for the Southeast Asia region; 2) develop human resources for the region; and, 3) disseminate and exchange information on aquaculture. The Aquaculture Department in the Philippines maintains 4 stations: in Iloilo Province, the Tigbauan Main Station and Dumangas Brackishwater Station; in Guimaras, the Igang Marine Station; and, in Rizal, the Binangonan Freshwater Substation. Highlights are provided of the research programmes and activities conducted by the department during the year 2001. Many projects were implemented in 2001: final approval of the Y895 million (P431 million) Laboratory for Advanced Aquaculture Technologies, the first-ever training in crab seed production, and the successful implementation of various verification projects within the Philippines in collaboration with the Bureau of Fisheries and Aquatic Resources. 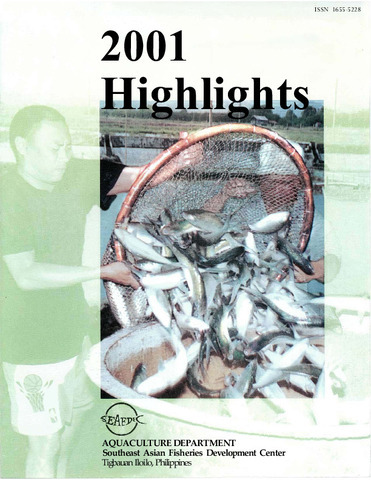 Region-wide, it was a spotlight year for AQD, whose reach was extended through the Mangrove-friendly shrimp aquaculture verification and training activities in the shores of Vietnam and Myanmar in cooperation with Thailand's Department of Fisheries. SEAFDEC/AQD. (2002). 2001 highlights. Tigbauan, Iloilo, Philippines: Aquaculture Department, Southeast Asian Fisheries Development Center.